Since reviewing Nakd bars a couple of months ago, I've become obsessed with them. They're tasty, filling and made from only whole foods, so they're completely natural, unprocessed and wholesome, which is what food should be, especially when you're looking to lose weight and get healthy. But what astounded me about them the most were their flavours. There's such a wide range of them, which you wouldn't expect from just natural ingredients, especially flavours like cherry bakewell or rhubarb and custard, but they truly taste like their claims, which make them even better and even more appealing if you're watching what you're eating. You can genuinely satisfy your taste buds without compromising on anything! And so, as someone with an unfortunately hefty sweet tooth, when Nakd released their new Nakd Nibbles, I had to try them. 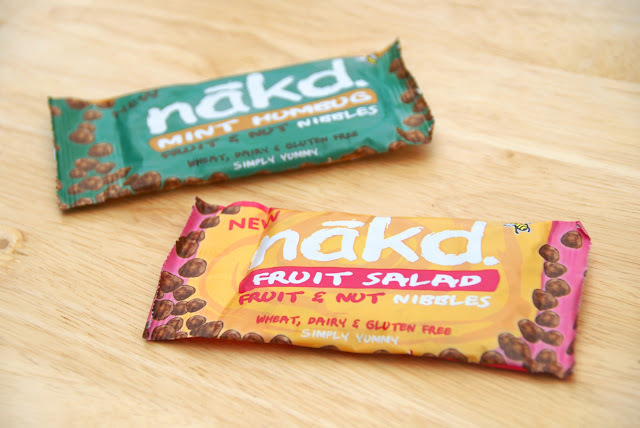 Nakd Nibbles are small packets of fruit and nut bites - like the bars, but small 1cm nuggets - and their flavours are derivative of old sweetshop favourites - Toffee, Mint Humbugs and Strawberries & Cream, for example. Like many of Nakd's bars, each 140 calorie bag counts as one of your five a day, and are suitable even for vegans. Though they don't look like much, just like the bars, they taste amazing. The packets are satisfying, too; it doesn't seem as though there are many in the bag when you pick it up, but that's because all of the nibbles nestle in together and sort themselves out flat. The bag is, in fact, full. The packets themselves are gorgeous, too! I love the colours of Nakd products and these are just as good, especially Strawberries & Cream and Fruit Salad. 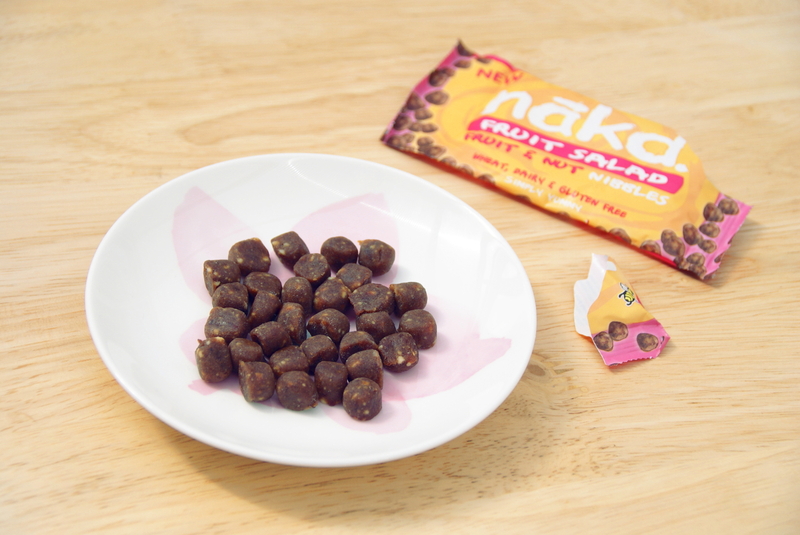 Once again, Nakd has created a wonderful alternative to a simple apple - not that there is anything wrong with apples! But you can get fruit fibre and all the nutrients without that same old apple taste. And yes, I love apples, but it's nice to have something a little different, and while Nakd bars provide that, Nakd Nibbles appeal to the child in us while allowing us to be healthy at the same time. You can get all 7 bags for £6.50 on their website, with free shipping and a 'sprinkling of freebies' in every order. I already bought myself a second box. I've got more Nakd bars and nibbles now than I know what to do with, but I don't think that's a bad thing. They balance out my biscuit collection. Disclaimer: I was sent this product to review by the brand itself. The quantity and precise products sent were their choice, not my own. All opinions and images are my own, and all appropriate research has been done by myself from a range of sources rather than relying entirely on the product's website, especially where health products are concerned. I do not accept a product to review if I do not believe it is safe or worth my own time, regardless of any kind of reimbursement. I trial the products for an appropriate amount of time before writing reviews to check for wear-and-tear on physical items and side effects from edible (be it supplements or food). If I have negative points to voice, I will voice them, and I never, ever accept product reviews or reimbursement on the promise of a positive review. My reviews are and will only ever be honest.